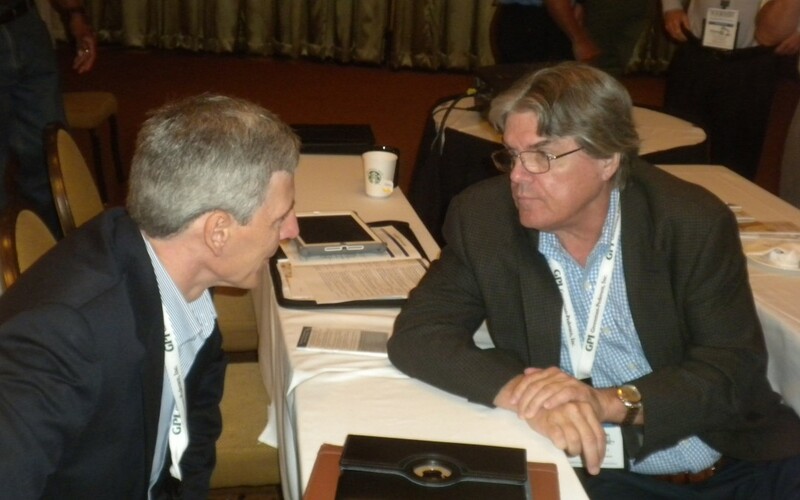 Pete Getchell (right) confers with Caltrans Director Malcolm Dougherty, chairman of AASHTO’s Subcommittee on Construction at a 2014 meeting. Pete Getchell, a contractor and longtime industry leader on the state and national levels, passed away Feb. 13 at the age of 68. For about 20 years, Pete was president (and later chairman) of PKF-Mark III, a heavy construction firm operating primarily in Eastern Pennsylvania and New Jersey. Pete was a past president and board member of the UTCA of New Jersey, ARTBA’s chapter in the state. He also served on ARTBA’s board from 1992 through 2014. Pete capped his national service with a term as president of ARTBA’s Contractors Division in 2013-14. Through all of these association leadership positions, Pete often represented the transportation construction industry before various types of audiences, including legislators, federal and state transportation executives, and other key government officials. He always did so with the utmost degree of eloquence, passion, civility and understanding of the issues at hand. For his selfless service to his industry colleagues, Pete received UTCA’s William Feather Memorial Award in 2010, and ARTBA’s Nello Teer Award in 2014. A native of Long Island, Pete earned a civil engineering degree from the University of Notre Dame. He retired from PKF-Mark III at the end of 2014, and unfortunately became ill with a rare form of cancer shortly thereafter. On a personal level, Pete will be remembered as an expert connoisseur of beer, a sailor and an animal lover. He is survived by Cathie, his wife of 46 years, as well as his mother, brother, sister and several nieces and nephews. The family has suggested memorial donations be made to a charity of the donor’s choice. A celebration of Pete’s life will take place in the near future. Along with Pete Getchell’s many friends in the transportation construction industry, ARTBA wishes his family the deepest of condolences.